When addressing endovascular procedures, complication avoidance is often aimed at the critical portions of a procedure where the risk for a catastrophic outcome is the highest, for example, when deploying a framing coil in a ruptured aneurysm or delivering a liquid embolic to a potential area of eloquent cortex adjacent to an AVM. A perfectly framed aneurysm can be a satisfying result for both the interventionalist and the patient, but this success is easily belittled when access site complications occur at the beginning or end of an endovascular procedure. Formidable complications, such as the loss of a limb, or even the need for unplanned rescue procedures or surgeries required to treat the complications, are avoidable with prudent preparation from the interventionalist. 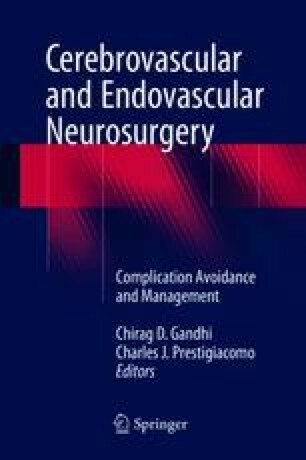 This chapter will address complication avoidance in arteriotomy site access and closure, as well as management when these unfortunate outcomes manifest.